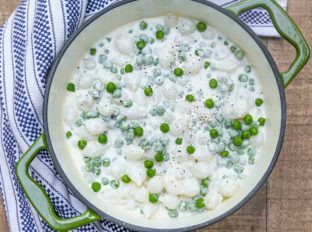 Creamed Onions And Peas made with peas, pearl onions, cream, and seasoning is the PERFECT side dish that’s ready in under 20 minutes! 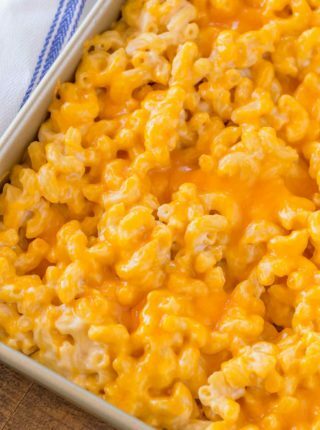 We’re always searching for the perfect side dish, and nothing compliments your main course as much as Baked Mac and Cheese, Creamy Bacon Pea Salad, or Classic Steakhouse Creamed Spinach. 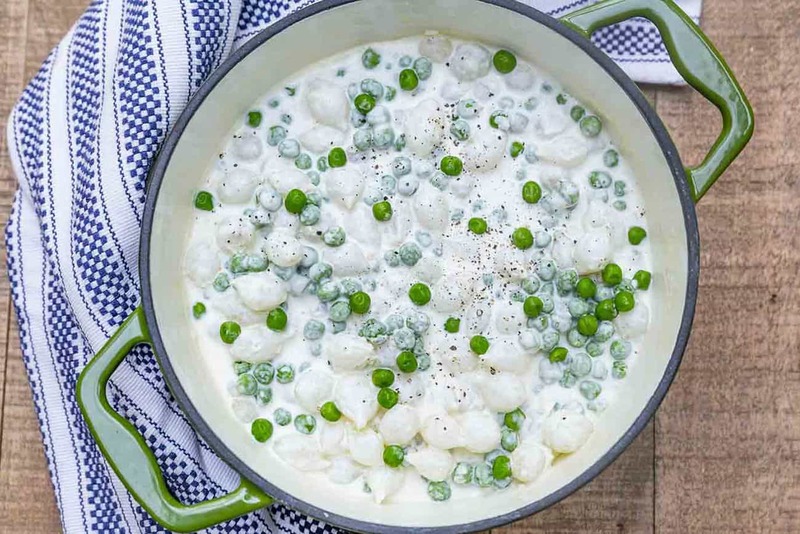 Creamed Onions and Peas is a creamy, savory side dish that has just a touch of sweetness coming from the pearl onions. 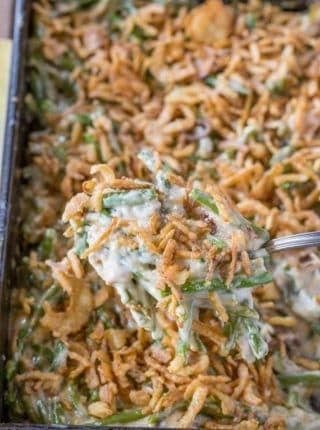 It’s the perfect side dish to serve with steak or chicken, and take less than 20 minutes total to make. Because they’re so quick and easy, I love to make these on weekdays. can i substitute regular onions for pearl onions? Pearl onions tend to be sweeter than their full sized counterparts. If you don’t have any available though, you can substitute a regular chopped white or sweet onion. You can add some sweetness back to the larger onions by caramelizing them in a pan with some butter for 2-3 minutes first. 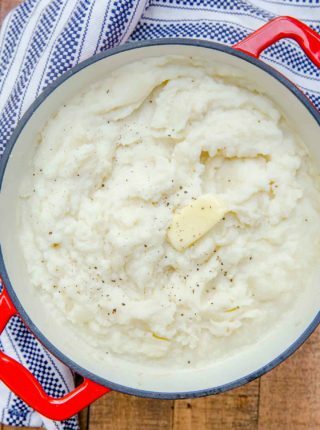 HOW DO YOU MAKE CREAMED onions and PEAS WITH CORN STARCH? If you want a thicker sauce, you can use corn starch. Corn starch has to be added cold, then gradually heated to thicken properly. are pearl onions and cocktail onions the same thing? Pearl onions are found in the produce section or frozen isle, and are raw. Cocktail onions are pearl onions that have been pickled, and usually come in a jar. You can use the pickled version in martinis, or on salads. Pearl onions are sweeter than full sized onions, so they work great in creamy or savory dishes like creamed onions and peas. If you use raw pearl onions, you should peel them before cooking. You can watch a video about how to easily peel a pearl onion here. 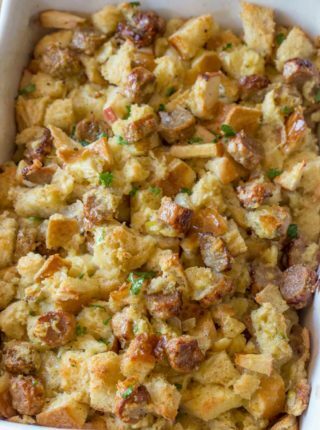 You can kick this recipe up a notch by adding some cooked chopped bacon on top when serving. The salty bacon goes perfectly with the creamy sauce! You can also add small pieces of ham, if you have some to use up. If you’re not a big onion fan, you can swap out the onions for your favorite type of mushrooms in this recipe. Easily peel fresh pearl onions by boiling them in water until they’re just soft, then putting them right into an ice bath. The skins should be easy to remove at this point. You can lighten this recipe up by using light cream or half and half instead of heavy cream, for less calories and fat. 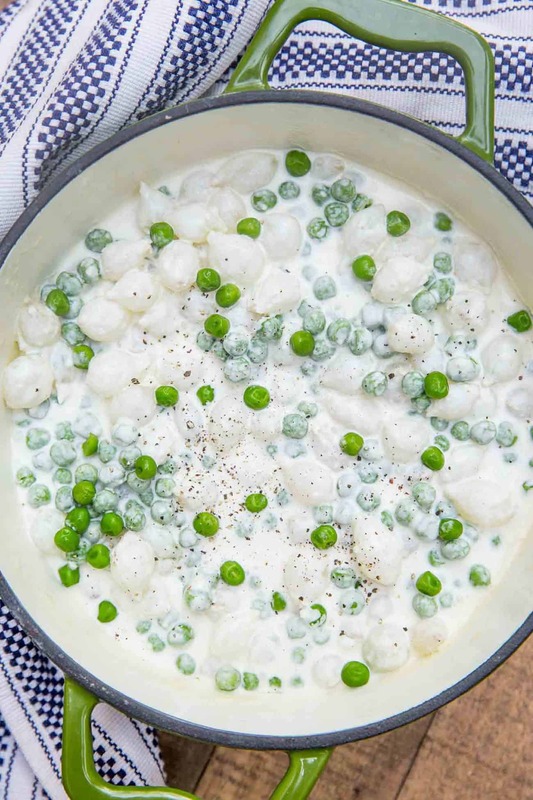 Creamed Onions And Peas made with peas, pearl onions, cream, and seasoning is the PERFECT side dish that's ready in under 20 minutes! Fill a pot with water and bring it to a boil on medium high before adding in the pearl onions and cooking for 10 minutes. Drain the water and the onions before adding in the butter, garlic, salt and pepper and letting it melt and become aromatic, about 1 minute, while stirring. Add in the onions and frozen peas and heavy cream, stirring to combine until the cream starts to thicken and the peas are warmed through, about 2-3 minutes. Thanks for the suggestion, Carol! This is the perfect side to any meal – thank you! I love this, it’s kind of like a cool retro recipe! We sometimes forget that the oldies are the goodies. I have to try it. I’ve never tried this! Looking forward to making your recipe. Love how quick this recipe is! Looks so delicious! Been looking for this recipe for years. Thanks for sharing. What a gorgeous dish! I’m not usually keen on onions, but I may give this a go!